Posted by Jill S. Schneiderman in Buddhist concepts, disasters, earthquakes, geology, Haiti. Recent reports from different media on the Haitian earthquake illustrate the human proclivity to separate mind and heart in response to so-called ‘natural’ disasters. In two U.S. Geological Survey (USGS) CoreCast 10-minute audio programs, using accessible language, Michael Blanpied, USGS Earthquake Hazards Program Coordinator, discusses the January 12, 2010 Haitian earthquake. In “Magnitude 7.0 Earthquake Strikes Haiti” (episode 117), Blanpied explains the science of the earthquake and related hazards, such as landslides. In “The Haitian Earthquake-A Week Later” (episode 118), Blanpied provides an update on the current situation in Haiti and answers questions about aftershocks. Additionally, perhaps as a means to assuage fears with knowledge, an article in the Christian Science Monitor explains clearly the January 20, 6.1 magnitude aftershock (Haiti Aftershock). Note that in the USGS CoreCast programs, Blandpied comments not at all about the suffering and human dimension of the earthquake. Therefore, because I believe that technical science talk alone will not sufficiently address the current situation, I was glad to hear host Tania Larson “Magnitude 7.0 Earthquake Strikes Haiti” (episode 117) express compassion for those who are suffering as a result of the earthquake. Blanpied’s talks are wise-minded. Larson’s concluding comments are kind-hearted. 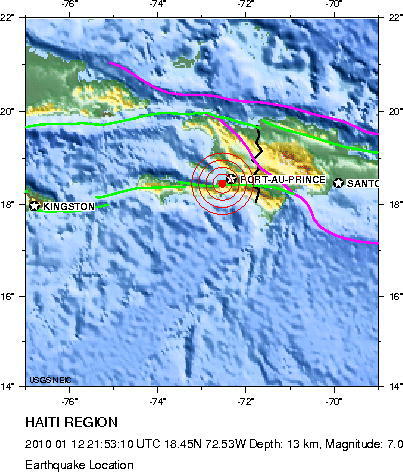 As we were going to press with this latest IUGS e-Bulletin, a magnitude 7.0 earthquake struck Haiti, near the city of Port-au-Prince on 12 January 2010 causing immeasurable loss of life and damage to critical infrastructure. As we usher in the year 2010, we are humbly reminded that many tragedies around the world often relate to the dynamic nature of planet Earth. As Earth Scientists, we all well appreciate the need to better understand the causes of natural hazards. It is terrible and unfortunate that events such as earthquakes, tsunamis, landslides and volcanic eruptions continue to impact such significant numbers of people around the world. Our collective efforts through geoscience education, practical field research and innovative studies can help to minimize the risks of natural hazards, reduce human vulnerability and enhance the safety of the global society. On behalf of the many geoscientists represented by the IUGS, we send our heartfelt condolences and sympathies to the many people affected by this recent catastrophe. This entry was created by Jill S. Schneiderman, posted on January 20, 2010 at 7:36 pm and tagged Buddhist concepts, Environment. Bookmark the permalink. Follow any comments here with the RSS feed for this post.